Losar is the name of the Tibetan New Year. In the Tibetan language, “Lo” means “Year” and “Sar” means “New”. The Losar festival pre-dates Buddhism in Tibet and goes back to the time when the Bon religion held sway in that country. In those days, incense was burned every winter in purification rituals used to placate the gods. As irrigation, cultivation, and refinement techniques were introduced, Losar ceremonies became more celebratory, as a gesture of thanks to the gods for the budding innovations. Eventually with the advent of rudimentary astrology, Losar became more than a farmer’s festival, finally mutating into a Buddhist festival, celebrating the New Year. 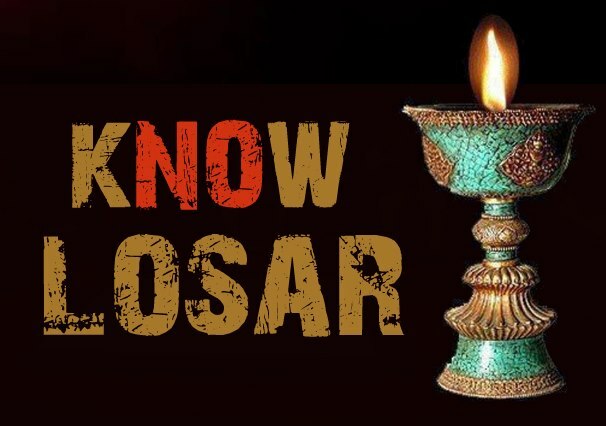 When and Where Is Losar Celebrated? Tibetan New Year festivities take place in January or February. Tibetan Buddhists follow the lunar calendar so the date of Losar is different each year. While Losar celebrations once lasted for as long as two weeks, in modern times, Losar is normally a three-day festival. Losar is celebrated by Buddhists in Tibet, India, Bhutan, Sikkim and in Tibetan expatriate communities throughout the world. In the days leading up to the Tibetan New Year, as part of the purification required for the new year, new clothes are made or purchased, houses are cleaned and decorated and new Buddhist prayer flags are raised. People usually spend the first day of Losar with members of their immediate family. They wear their new garments and eat celebratory foods such as guthuk noodles, made from cereals and dried cheese, and various types of vegetable soups. They often drink Changkol, a type of rice wine similar to Japanese sake. Dough balls containing small hidden items, such as chilies or coal may be served to guests. Whatever you find inside your dough balls is supposed to be a light-hearted reflection of your character. A white article such as rice or salt found in your dough ball indicates that you’re going to be lucky in the forthcoming year; a black article such as a small piece of coal suggests the opposite. On the second and third days of Losar, people visit friends and other family members who don’t live close by. They may also pay a visit to their local Buddhist temple, monastery or shrine and make offerings as part of the purification rituals for Losar. Losar is an important time for Buddhist monks. The monks spring-clean their monasteries and put up special decorations. They recite prayers and perform rituals to dissolve negativities of the old year and purify the new year. Monks also make a point of wishing good luck for the forthcoming year to the Dalai Lama. At first sight, the naming of each Tibetan New Year appears to be a little complicated. However, the process is quite logical when you understand the naming rules. For example, the Tibetan year that started in February 2005 is the Female Wood Bird year. This will be followed by the Male Fire Dog year, then the Female Earth Pig year, and so on, in a sixty-year cycle. Check in YouTube if the id PLuQG8dUicknfPjV_JEJWcP8TNkENb_Sb0 belongs to a playlist. Check the FAQ of the plugin or send error messages to support.